The next-gen Commodore being put through its paces as testing continues ahead of its release in February next year. Ahead of its Australian launch early next year, the next generation Commodore has been boosted with global automotive experts shortlisting the Opel Insignia for the 2018 World Car of the Year awards. Developed hand-in-hand with the next-generation Commodore, the Opel Insignia has received rave reviews in Europe since its introduction earlier this year. Drivers have cooed over its sleek but muscular styling, praised its high-tech features including wireless charging and a 360-degree camera, and enjoyed its effortless performance. And now, it’s all been recognized on the biggest of stages. “The World Car of the Year awards is judged by automotive journalists from Asia, Europe, and North America,’’ says Holden’s executive director of sales, Michael Filazzola. “That Insignia has been shortlisted is a testament to the hard work the team in Europe and Australia have put into the vehicle,” he said. Local development on Commodore is ongoing with work focused on the V6 AWD VXR and V6 AWD Tourer models in particular. “The World Car of the Year shortlisting shows the next-gen Commodore is based on an already exceptional vehicle,” says Holden’s vehicle performance manager Jeremy Tassone. 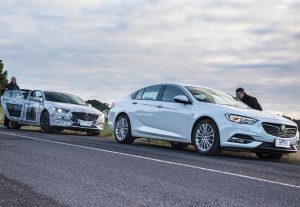 “We’ve been working on the car for a while now to make it even better for Australian roads and by the time it lands in the hands of our customers, we’re confident it will demonstrate all of the great driving and technology characteristics Commodore has built its name on,” he said. The all-new Holden Commodore will be available from Holden dealers nationwide, including Macarthur’s own Paul Wakeling Holden, from late February 2018.